The 1999 Platinum Eagle brought the series to its third year of release. The American Platinum Eagles were offered in bullion format through a network of authorized purchasers, and in proof format directly from the United States Mint. The bullion versions of the coin, which featured the Statue of Liberty on the obverse and a soaring eagle on the reverse, saw a shift in demand for certain denominations. Sales of the one ounce coins experienced a significant drop from the elevated level of the previous year. Sales of the one-half ounce and one-quarter ounce coins remained flat, while the one-tenth ounce coins rose. 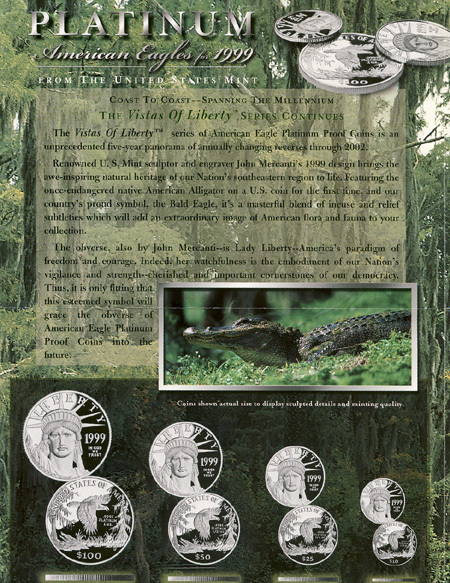 The United States Mint continued the “Vistas of Liberty” design series for the collector versions of the coins. 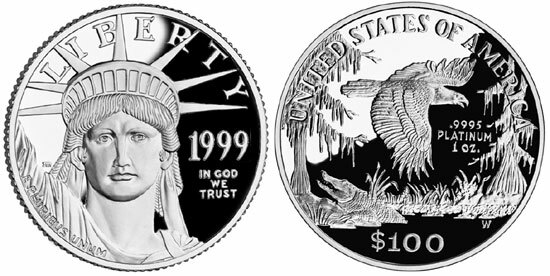 The 1999 Proof Platinum Eagle carried a depiction of the bald eagle in the southeastern wetlands of the United States, designed by John Mercanti. The eagle flies above the once endangered native American Alligator. The collector coins were billed as the “final year of the 20th Century”, however the early excitement about the series had begun to diminish. Final mintages for each of the proof coins showed a decline compared to the previous year. The average price of platinum during 1999 was $377.93.